Following yesterday's introduction of the iPhone 5s, a new GFXbench result showing partial graphic benchmarking results has appeared revealing significant improvements compared to the iPhone 5 on the Egypt HD 2.5 test (via @nerdtalker and @anexanhume). A comparison between the iPhone 5s and iPhone 5 on the Egypt benchmark show a significant increase in frame rate for the iPhone 5s, with the offscreen 1080p score moving from 29.8 fps to 56.0 fps and the onscreen score improving from 41.1 fps to 53.0 fps. Certainly there are some caveats associated with the benchmark given that it includes only a single test and a need for developers to optimize their apps for the new 64-bit A7 architecture with support for OpenGL ES version 3.0 in the iPhone 5s will undoubtedly yield differing levels of improvement in real-world situations. Still, based on this single snapshot it appears the graphics performance will indeed see a significant improvement in the new device. Impressive. But I'd rather see Apple focus on improving Siri. I ask Siri to set a timer and she spends 10+ seconds going out to Apple's server to figure out what I want to do. Ridiculous. Am I the only one who doesn't experience these exaggerations in real life? I swear, I'm starting to think my iPhone and iPads are special or something....it doesn't take Siri nearly as long as others lead me to believe. Accuracy is what I'd like to see improved. Yeah, that's great and all, but £469 for the 5C?! what the hell are you thinking Apple?! Excellent graphic performance with a tiny screen? Apple really needs bigger screen size phones. And once Apple releases that larger smartphone that is a pain to pull out of pockets, a pain to use with one hand and generally clunky to use, they will feel compelled to release a smart watch that does basically nothing useful and only has 1 day battery life. these graphs are so deceiving. It's about right, actually. 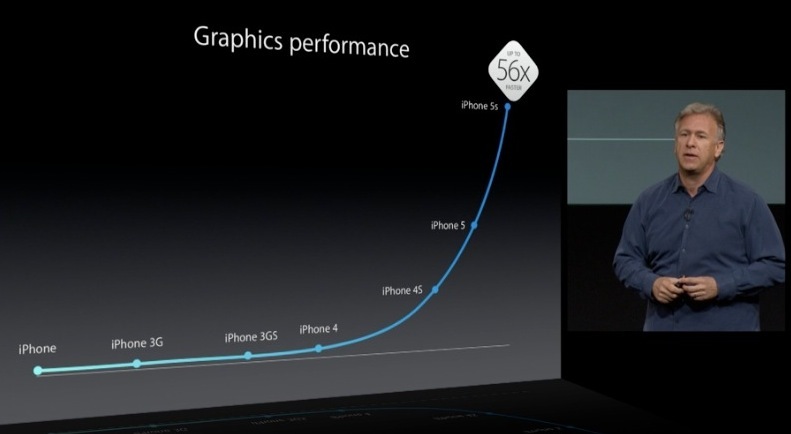 They didn't say each iPhone has been consistent with growth of speed. Those results will improve when the next LLVM/Clang set of optimizations are added to pre-existing code-bases. Yup. ImgTec even says to watch the charts as they update the drivers. The more curious thing is that report of "Apple GPU" for GPU Vendor, as opposed to it reading Imagination Technologies in previous A-series SoCs. Note 3 isn't 64 bit.